Now it can be easy and stress-free to follow a fertility diet. Take the guess-work out of your meal planning and grocery shopping. Feel confident that you're fueling your body and fertility the best way possible. Discover and achieve the benefits of food as medicine. What you eat has a huge impact on your fertility. Learn to harness that power for yourself. With delicious, healthy, easy-to-prep (without weird, odd-ball ingredients), meals that will boost your fertility, balance your hormones, support egg and sperm quality, support IVF success, and reduce chances of miscarriage. Week 1 is formulated to support your fertility during your menstruation week. It targets replenishing essential iron and minerals, balancing estrogen, and supporting your follicle growth and egg quality. Week 2 is formulated to support optimal estrogen levels, follicle growth, and egg quality, as well as to support ovulation. Week 3 supports progesterone levels and healthy endometrial lining for a strong implantation. Week 4 targets progesterone and estrogen balance, liver detoxification pathways, and healthy embryo implantation. 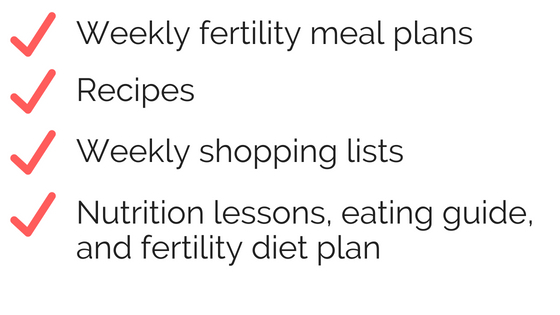 Based on over 70 scientific studies and ten years of clinical experience and study, I've scoured the research for you, whittled it down, and devised 4 weeks of targeted and specific meal plans that will support your fertility. You talked and I listened. What I've heard again and again from my clients is that it can feel overwhelming to navigate all the information out there telling you what to eat and what not to eat. It can feel confusing and maddening to put it all together and figure out what you should eat exactly. Now you don't have to do it alone. This meal plan lays it all out for you. With recipes and shopping lists to make it easy for you. The science is in, and studies are showing that what you eat has a huge impact on your fertility. Make sure you're using this information and scientific evidence to your advantage. All while eating delicious meals, and not having to over-think it. What types of food does the meal plan include? The Becoming Mama meal plan is a Mediterranean based diet that includes animal protein, lots of vegetables and healthy fats, and is low in processed foods, low carb, and low GI (glycemic index). It has been created as a result of numerous studies, a lot of research, and hours of honing recipes in the kitchen. What types of foods will the meal plan exclude? 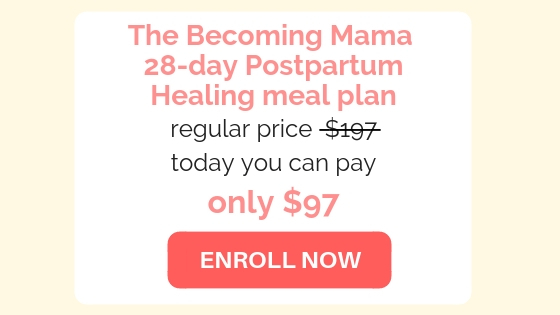 The Becoming Mama meal plan is intentionally designed to be low in wheat, gluten, corn, dairy, and high-GI carbohydrates like pasta, bread, rice, and breakfast cereals. Is the meal plan suitable for vegetarians and vegans? 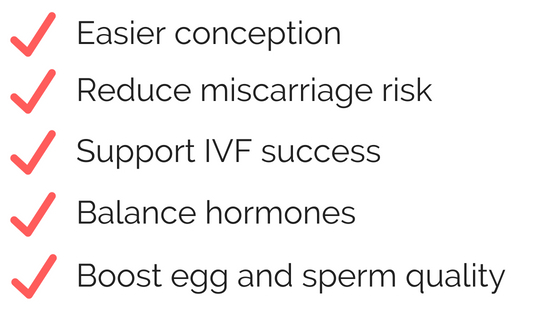 While I would love to support vegetarians and vegans (I was vegetarian myself for many years), advising how to obtain sufficient nutrition for fertility on those restricted diets is complex. The Becoming Mama meal plan recommends the regular consumptions of fish and animal protein. This is an easy and effective way to ensure we get the nutrients we need for hormonal balance and fertility. The scientific evidence supporting this is too strong to ignore. Yes, snacks are included and an important part of the meal plan. What if I don't have a lot of time to prepare meals? I have chosen the quickest and simplest recipes I could because I know how busy you are. The weeknight meals are designed to be the quickest. I reserve the slightly more involved recipes for the weekend. I've designed it so that weekday breakfasts are quick and many are even make ahead to save you time. Lunches usually involve leftovers of the previous nights' dinner, so you don't have to prepare a third meal every day.